The Weston #22 meat grinder is the meat grinder of last resort. If you have been an owner of several cheap meat grinders that broke down soon after purchasing them, you might have heard that Weston #22 is the only grinder you can trust. This 700 watt 1 HP motor meat grinder can grind anything that goes down its tube. It is purely made from hardened stainless steel including its gears. This is the perfect grinder for your kitchen. It comes with all the accessories required to make sausages for your family right in your kitchen. 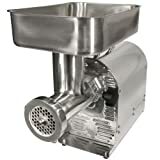 This meat grinder is so effective that it is being used in many businesses for commercial meat grinding since it can handle hundreds of pounds of meat. If you need one for your business, you can take a look at Weston #22 commercial grinders. Weston #22 1 HP Stainless Pro-Series Meat Grinder and Sausage Stuffer has the capability to grind between 9 and 12 pounds of meat every minute. This translates into between 540 and 720 pounds of meat in an hour-marvelous. This grinder is the king of meat grinding as very few grinders, if any, that can offer this grinder competition. This giant meat grinder suits meat retailing shops, restaurants as well as homes that use large quantities of ground meat. Weston #22 is also very effective when used by hunters as it can grind game meat such as deer, elk and moose just like any other meat. Construction: The sausage stuffer is metal constructed to offer it superior grinding performance. It features several high quality accessories such as a large stainless steel tray, a large stomper, safety function to turn it on, off or reverse, grinding knife made of stainless steel as well as coarse (7mm) and medium (4.5mm) grinding plates. It also has 3, 20mm, 30mm and 40mm stuffing funnels with a stuffing star and a flange. That’s not all. You will also find a 10mm snack stick funnel made of stainless steel as well as a top-speed stuffing Cyclone auger. You will also be surprised to learn than this meat grinder is warranted for bones, therefore you don’t have to worry when a small bone goes down the tube. It will be ground into fine pounder-like substance and you won’t even distinguish it from the rest of the ground meat. #22 comes with a 1 HP 750 watt motor that handles 9-12 lbs. of meat every 60 seconds. With such features and specifications, Weston #22 Commercial Meat Grinder, 1 HP is the grinder that will power through anything that goes down its tube. Its power and strength can be compared to none. Its speed is amazing and the quantity of meat it can handle a day remains imaginative. It is the perfect meat grinder for your commercial needs. Its resistance to breakdowns makes it a plus for your business. The ability to produce the finest sausage meat is another big plus for your business. What is a Meat Grinder? Copyright 2018 Best Meat Grinder Reviews In The Market.